Fabricworm Giveaway! From Ellen Luckett Baker's New Garden Collection! Another week starts, and therefore so does another Fabricworm Giveaway! 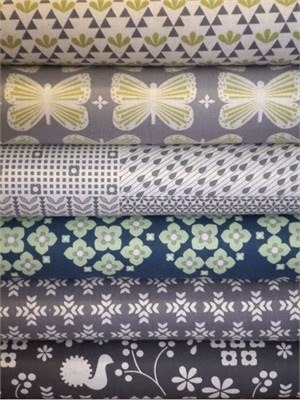 This week we're giving away a fat quarter bundle of Ellen Luckett Baker's Garden collection in the Grey colorway! You could win this fat quarter bundle! 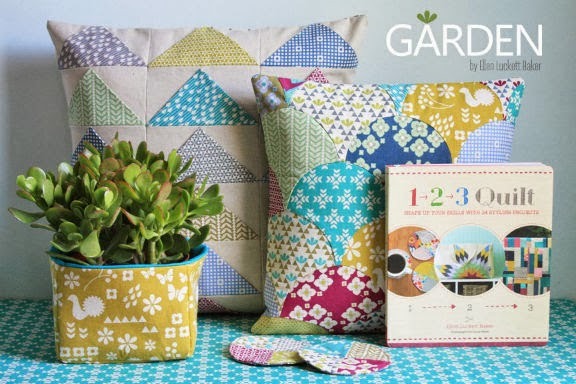 And check out the Garden Collection here. This giveaway ends on Sunday 1/5 @ 11:59pm PST. The winner will be contacted shortly after by email. The winner will be chosen by random.org through Rafflecopter. Just a few more days of our large bundle sale. We've already marked them down 10%. We also have a few more Girls and Boys Scrap Packs which have been marked down 40%! If you wake up with a Fabricworm gift card Christmas morning; hurry before the sale ends Thursday, Dec. 26th at 8AM PST. These new softies come without the dimples and are softer than puppy ears. We've got tons of colors for backing blankets, sewing scarfs, and anything else you want to have a smooth feel to. Welcome newborns to the marvelous world of whimsical giraffes, lions, elephants and zebras amongst bold blossoms and fairy tale script. The cheerful color palette becomes a canvas for dreamy dots, festive flags and serene scalloped prints. This menagerie of designs is ideal for quilts, pillows, nursery decor and more! Cori loves the idea of the things, words and experiences that fill us up. The thoughts in our heads as we move through our days. What stands behind us to make us who we are. Our history. Our future. ESPECIALLY how things smash together to make new things (like an inaccurate memory) - Her artwork is based on these things. New from Robert Kaufman is the primary pleasures of Betty Dear 2, we love the versatility of their size and color. This bundle of 9 prints comes in fat quarters & half yards. We couldn't resist putting this Dream Team bundle together. Use these prints for an expecting friend or for your little one. Perfectly coordinated bundles like this make quilting easy peasy. A classic tale of travel brought to you from our friends at Riley Blake. Pack your bags and head out to view the world; leave no destination untraveled. Whether your taste is whimsical, elegant, classic or playful, there’s something for everyone with BoBunny. Travel to mythical lands. Embark on adventures far and wide. Delight in the rich stories of yore. Lisa Congdon depicts a world of marvel and where all things can happen in The Land That Never Was. 16 Restocked colors in now. Back by extreme demand, Cloud9 Organic quilt weight cottons of the Entire Bark & Branch collection. Eloise Renouf takes us a stroll though the woods in a journey through seasons. Late summer/early autumn brings the dense greens to golden hues and then into winter we are met with cooler colors, shorter days and sparseness. While we are expecting this new collection any day, feel free to view the free bag Tutorial on our blog now. Click Here for full instructions. Hey Fabricworms! We are having a Bundle Sale!